Root Canal Therapy – Yandina Dental. With modern technology, it’s not as bad as you think! 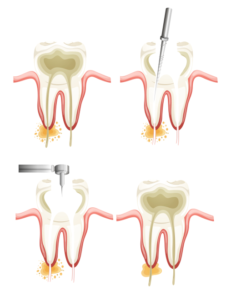 Root canal therapy is a treatment to repair and save a badly damaged or infected tooth. Common causes affecting the pulp are a cracked tooth, a deep cavity, repeated dental treatment to the tooth or trauma. The term “root canal” comes from cleaning of the canals inside the tooth’s root. The most important thing to remember is that whilst the tooth is “dead” after root canal therapy is completed, it is still functional. If you are given the option of extraction versus saving the tooth with root canal therapy, it is advised that you try and save it where possible. If you have a sore leg, it is best not to amputate it and replace it with a prosthetic leg. First visit, an opening is made through the back of a front tooth or the biting surface of a molar or pre-molar to access the pulp chamber. The diseased pulp is removed with small files, flushed out with medicaments and an antibiotic dressing is placed. A temporary filling is placed in the crown to protect the tooth between visits. In the next visit, the pulp chamber and root canals are cleaned, enlarged and shaped in more detail so that the tooth is ready for being root-filled. Again a temporary filling is placed after some more antibiotic dressing is put down the canal(s). Finally, the temporary filling is removed and the pulp chamber and root canal permanently filled. A tapered, rubbery material called gutta-percha is inserted into each of the canals and is sealed into place with cement. Once the tooth has settled down (usually about 3-6 months), a crown is placed over the tooth to restore its natural shape and appearance, but most importantly to prevent it from breaking. If the tooth is very broken down, a post may be required to build it up prior to placing a crown. As there is no longer a pulp keeping the tooth alive, root-treated teeth can become brittle and are more prone to fracture. More often than not, a crown is advised to protect the tooth from breaking. We see no point here at Yandina Dental spending time and money to save a tooth with root canal therapy, only to have it fracture unfavourably whilst chewing. It is best to finish off the job properly! Your treated and restored tooth/teeth can last very well with proper care. Excellent oral hygiene, along with regular dental exams and professional cleans are necessary to prevent further problems.